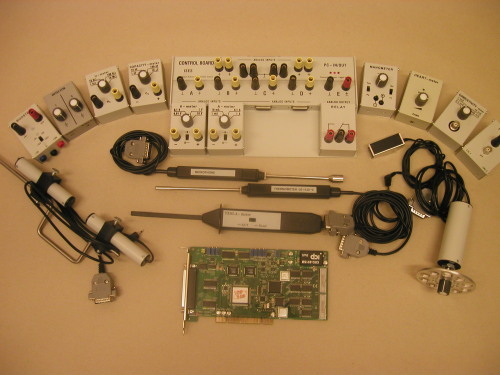 Hardware configuration: the computer interface card PCI ADDA convertor-12 bits, time of conversion - 0.01 ms, DMA, an universal control board and a set of sensors (for physics, chemistry and biology). The system offers the possibility of simultaneous measuring and data displaying for 8 input channels and process control via 2 analogue and 2 binary output channels. 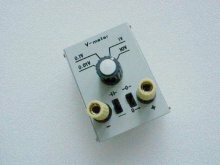 The analogue outputs channels work as programmable voltage sources (DC, AC with eight kinds of default signals, manual controlling or user defined signals). Maximum sampling frequency (100 kHz) enables studying of sounds or other high periodicity signals. 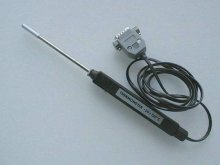 The ISES system is supplied with a set of sensors - ammeter, voltmeter, thermometer, simple position sensor, capacity-meter, ohmmeter, force meter, anemometer, microphone, sonar, light gate, pH-meter, conductivity meter, heart frequency meter, current booster, repro, loudspeaker, relay, electromagnet valve for liquids and others. It is possible to study current, voltage, capacitance, resistivity, mass and force, pressure in liquids, etc. In chemistry the acidity, exothermic and endothermic reactions, titration and many other processes can be studied. Biology students can measure for example some periphery blood vessel system functions. The ISES modules are easily interchangeable, the computer, provided with the automatic calibration, automatically senses their presence and adjusted range.